Tiny diamond grains discovered in high-grade metamorphic rocks (gneisses) from south-western Norway may force geologists to rethink cherished ideas about the Earth’s continental crust and processes. Discovered by an international team of Russian, Norwegian, British and US geoscientists,1 the diamond fragments at only 20–80 micrometres in size are too small to see without a microscope. Yet they have formed within the continental crust where they shouldn’t have! According to all the geology textbooks, diamonds can only form in the Earth’s mantle at depths of more than 120 km (75 miles), where the exceedingly high pressures and temperatures—40 kbar and 900°C—squeeze carbon into the ultracompact crystal structure of diamond. The diamonds then reach the surface when explosive volcanic eruptions force the molten rock containing them up narrow conduits (pipes) through the crust. However, these Norwegian microdiamonds just do not comply with the textbooks! Whereas they should have been in volcanic mantle rocks, they were found in metamorphic rocks. Originally formed as ancient sedimentary deposits on the Earth’s surface, these layers of sediments are believed to have been compacted and cooked (400–450 million years ago!) when another continent (Laurentia) rammed into what is now Scandinavia (the ancient Baltica). Although such continental collisions (also expected to have occurred in a catastrophic plate tectonics Flood model3) are believed to be capable of metamorphosing crustal rocks, they are considered far too ‘docile’ for making diamonds. According to Dobrzhinetskaya et al.,4 geothermobarometry, textural studies and fluid-inclusion analyses indicate that the high-pressure phase of metamorphism that produced these Norwegian gneisses involved conditions of 17–21 kbar and approximately 630–820°C. However, this is still not nearly enough to mould carbon into diamond, says Haggerty and conventional wisdom. Significantly, this Norwegian discovery is not the first, geologists having already reported finding examples of microdiamonds in metamorphic (crustal) rocks twice before, in 1990 in Kazakhstan5 and in 1992 in eastern China.6 While skeptical researchers questioned those earlier reports, this Norwegian discovery makes it harder for the geoscience community to ignore the obvious conclusion that diamonds may also form in crustal rocks. Dobrzhinetskaya et al. are cautious in their report and do not speculate how these crustal rocks could have been subjected to the mantle conditions claimed for diamond formation, yet Dobrzhinetskaya independently tries to explain the presence of these microdiamonds in these Norwegian metamorphic rocks.8 She suggests that the ancient continental collision forced pieces of the crust down to mantle depths temporarily, where carbon in the sedimentary layers then turned into diamonds before the crustal rocks rose back to the surface. Haggerty, however, suggests that the diamonds might have formed without a trip into the mantle. Industrial researchers, he notes, have learned how to grow extremely thin diamond films at very low pressures. Therefore, because the microdiamonds from Norway, Kazakhstan and China are so tiny, he speculates that they may have formed at pressures found in the crust. So should geologists now have to rewrite some basic textbooks as Monastersky concludes? No, not yet, because Haggerty, Ernst, Monastersky, and even Dobrzhinetskaya all overlook one key issue—Dobrzhinetskaya et al.11 admitted that they had not yet identified the microdiamonds in situ in the gneiss (they recovered them from crushed rock), and therefore they had no indisputable evidence to support either a metamorphic or an alluvial origin for the grains. That’s right—there’s still the possibility these micro-diamonds were deposited in the original sediments (by erosion from source rocks) before they were metamorphosed! In any case, the uniformitarian (slow-and-gradual) model of plate tectonics, which involves millions-of-years for continental collisions, is hard pressed to explain how crustal rocks could go down to mantle depths of 120 km and bob back up again. On the other hand, catastrophic plate tectonics during the Flood year12 with metres per second crustal movements would have inevitably resulted in violent continental collisions, the tremendous forces involved buckling crustal rocks to the extent of ramming some portions down to mantle depths. However, this would be short-lived, for as the crumpled collision zone ‘relaxed’ very soon after the impact, the lower density continental crustal rocks thus rammed into the mantle would rapidly rebound. No wonder geologists are confounded by these microdiamonds! Perhaps the ‘mystery’ surrounding them would be easily solved if they abandoned their uniformitarian presuppositions. Maybe catastrophic plate tectonics during the biblical Flood is the better model for earth history? 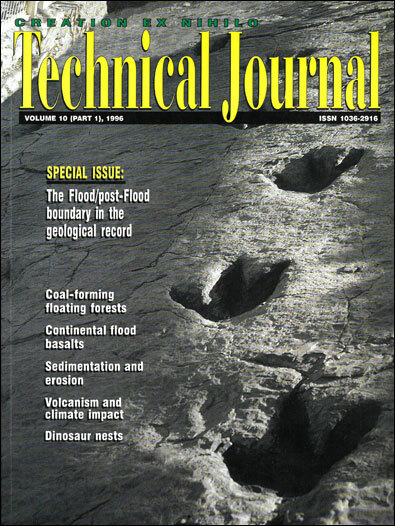 Dobrzhinetskaya, L.F., Eide, E.A., Larsen, R.B., Sturt, B.A., Trønnes, R.G., Smith, D.C., Taylor, W.R. and Posukhova, T.V., 1995. Microdiamond in high-grade metamorphic rocks of the Western Gneiss region, Norway. Geology, 23(7):597–600. Return to text. Monastersky, R., 1995. Microscopic diamonds crack geologic mold. Science News, 148:22. Return to text. Austin, S.A., Baumgardner, J.R.,Humphreys, D.R., Snelling, A.A., Vardiman, L. and Wise, K.P., 1994. Catastrophic plate tectonics: a global Flood model of Earth history. In: Proceedings of the Third International Conference on Creationism, R.E. Walsh (ed. ), Creation Science Fellowship, Pittsburgh, Pennsylvania, pp. 609–621. Return to text. Dobrzhinetskaya et al., Ref. 1, p. 599. Return to text. Sobolev, N.V. and Shatsky, V.S., 1990. Diamond inclusions in garnets from metamorphic rocks: a new environment for diamond formation. Nature, 343:742–745. Return to text. Xu, S., Okay, A.I., Ji, S., Sengör, A.M.C., Su, W., Liu, Y. and Jiang, L., 1992. Diamond from the Dabie Shan metamorphic rocks and its implication for tectonic setting. Science, 256:80–82. Return to text. Monastersky, Ref. 2. Return to text. Austin et al., Ref. 3. Return to text.